It has taken me a while to gather and formulate some thoughts on the situation in Mali. First, I will indulge in some subjective expressions of love for Mali. Mali is beautiful, and represents a part of an ancient African culture and wisdom that was so advanced, civilized, and mystical, that it was beyond the understanding of “Western” culture at the time. Within the shifting desert sands, an ancient and civilized culture of knowledge, scholarship and the arts was built, a civilization that was undisturbed by the ravages of invasion for many centuries. Perhaps the best way to convey the majesty of Mali is through the exquisite music of musical genius, Salif Keita, where you can perhaps find some of his music that has not been purged from YouTube. In recent years, the ancient manuscripts that had been buried in the desert for safekeeping from the plunder by colonial forces for centuries, were rediscovered. Much excitement was generated, and everyone wanted a piece of the action. The manuscripts restoration project received support from the South African government as a special project of President Thabo Mbeki, who had a dream of an African Renaissance. Financial and practical support was given by the South African government, and variously, the National Archives of South Africa, National Library of South Africa, and others contributed to the project. The most stellar work has been done by Dr Shamil Jeppe and his team at the University of Cape Town based Tombouctou Manuscripts Project. 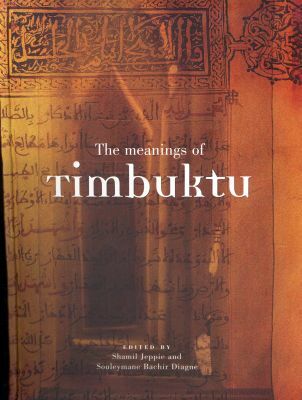 Shamil co-edited this beautiful book, entitled “The meanings of Timbuktu” which I have a copy of, and it is a truly exquisite accounting of the scholarly highlights contained in the manuscripts. The sheer irony. After having been protected for so many centuries, the unearthed manuscripts now came under threat from the recent conflict in Mali. A report came out that the library had been burned to the ground, the manuscripts were all destroyed and lost forever, and the story went viral. Like all of us who love cultural heritage, my heart broke, but then I thought, before reacting – to wait for further reports. I am happy I did. The initial story is here: http://www.guardian.co.uk/world/2013/jan/28/mali-timbuktu-library-ancient-manuscripts And sure enough, thanks to the efforts of Shamil Jeppe and his team, we received an interim update that gave a very different version of what had occurred. In fact, the library had not been burned at all, but it was looted. Some manuscripts had been destroyed, but the majority of them were safe. See this comprehensive and credible report from the Tombouctou manuscripts project here: http://www.tombouctoumanuscripts.org/blog/entry/timbuktu_update/ If my book was not already at the printers, I would have used this as a graphic illustrative example of the need for media literacy. Too often, people simply believe what the media says, and in situations of conflict where it is difficult to obtain reliable source information, unreliable sources can be quoted or misinterpreted, conclusions can be jumped to, misinformation goes viral and becomes accepted as fact. The full range of information literacy skills, including media literacy, has never been more essential in this age of instant and prolific information output. There is a lesson to be learned here. But most of all, we need to collectively improve our ability to protect our priceless cultural heritage. My heart goes out to the people of Mali. This entry was posted in Information Literacy and tagged Cultural Heritage, Information Literacy, Kim Baker, Mali, Media Literacy, Timbuktu. Bookmark the permalink. Really great article, thanks for this. One thing is for sure, a wider part of the world are aware of these fantastic resources now, than they were before.